The Cleanest and Healthiest Countertop Water Purification / Filtration & ionization System. Decent price for a water purifier/ filter & natural ionizer – Convenient, Stylish, Affordable, Naturally Filtered , Mineral, Alkaline , Antioxidant & Ionized Water. AlkaViva proprietary UltraWater purification / filtration & ionization technology changes tap water that is oxidizing water , chemical-laden water into clean / filtered/ purified mineral rich water as well as into alkaline water, antioxidant water naturally -> naturally ionized water . It’s like having a pristine mountain stream filled with an ocean of antioxidant water coming from your tap water ! Drink the Cleanest,Healtiest,Mineral Rich, Alkaline, Antioxidant , Ionized Water! How does UltraWater purifier / filter water filtering / contaminant removal compare with other brands that just use basic old-style carbon water filters? Independent, EPA certified laboratory testing in the USA, confirms that 99.9% of virtually all tap water contaminants are removed/filtered from water. This next generation in water filtration technology removes pharmaceuticals, heavy metals, pesticides, chlorine, chloramines, fluoride, and other chemicals from tap water. Give your family the cleanest , purest, mineral rich ,alkaline, antioxidant water, free from dangerous contaminants! Drink the cleanest , purest, mineral rich ,alkaline, antioxidant water – healthiest water! Developed after 2 years of extensive R&D, toghether with doctors, engineers & water specialists, the UltraWater filter has up to 1000 times more water acid neutralizing power than tap or bottled water, and more water antioxidant potential than any food, juice or pill. Plus, it’s a delicious way to stay hydrated and pH balanced. Drink safest water ! Made in the USA. The UltraWater purifier/ filtration technology in the UltraWater pHD Non-electric Countertop gives you the confidence from being USA made. AlkaViva water filters contain only carefully sourced and proprietary water ionizing media – nothing is used in AlkaViva water filters that is not safe and contaminant free. Drink cleanest , purest, mineral rich ,alkaline, antioxidant water, with convenience! It is the ultimate in water flow-through convenience. You never have to wait unlike with water pitchers and other non-electric gravity systems for water filtration / purification . With other alkaline water ionizers – electric or non-electric – you are drinking the health enhancing properties of alkaline ionized water they offer along with the common contaminants found in tap water. With UltraWater purifier/ filter & ionizer you get both: the cleanest water & the healthiest (mineral rich, alkaline, antioxidant) water . Enjoy great tasting, alkaline, ionized, mineralized rich and antioxidant water! 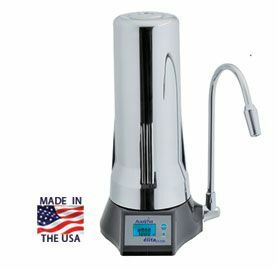 The UltraWater filtration / purifier technology in the Elita CT 700 pHD Non-Electric Countertop gives you the cleanest and healthiest water from any countertop water filter – guaranteed! Independent, EPA certified, laboratory testing in the USA, confirms that 99.9% of virtually all tap water contaminants are removed. This next generation in water filtration technology removes / filters pharmaceuticals, heavy metals, pesticides, chlorine, chloramines, fluoride, and other chemicals fro mwater . UltraWater filter / purifier & ionizer has up to 1000 times more water acid neutralizing power than tap or bottled water, and more water antioxidant potential. Plus, it’s a delicious way to stay hydrated and more pH balanced.